As most -- ahem -- cannabist enthusiasts can already tell you, beer can occasionally smell a bit like weed. That's owing to the fact that both hops and marijuana are part of the same taxonomic family of Cannabaceae, and also maybe because cannabis enthusiasts smell the stuff everywhere. But now, Oskar Blues has decided to up the ante and create a beer with the sole purpose of smelling like weed. Oh, and tasting great, too. Pinner Throwback IPA is a 4.9% ABV dry-hopped IPA that -- according to brewery founder Dale Katechis via The Cannabist -- is "a relaxant." 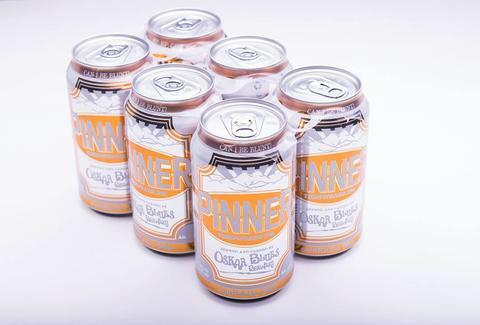 Oskar Blues "wanted to create a beer, an IPA that had a great deal of aroma, that’s reminiscent of a lot of [their] other hoppy beers and aromas but that’s also sessionable, with the lower alcohol so you could have more than one or two." Marijuana may not be legal in many places besides the brewery's native Colorado, but fans of it who also enjoy smooth-tasting, drinkable beers can find common ground in Pinner, which will be available in 41 states starting on March 1st. Adam Lapetina is a Food/Drink staff writer at Thrillist, and quite bluntly thinks this sounds delicious. Read his musings at @adamlapetina.